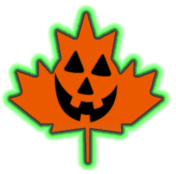 Canadian Halloween is Canada's #1 Halloween Web Site Destination. From Halloween Parades to Halloween Parties, Ghost Trains to Haunted Trolley Tours, Haunted Houses to Yard Haunts, Halloween Props and Halloween Costumes, you will find all you need here to make your Halloween Fun, Safe, and Scary! Canadian Halloween .com is your online guide to Halloween Celebrations across Canada and we want to post your Halloween Attractions and Events for FREE on our web site! Thousands of Halloween enthusiasts of all ages use our web site for their Halloween event planning. This represents an exciting opportunity to promote your Halloween Attractions and Events to your target market. We provide a Free Text Listing under the appropriate category heading that links back to your web site. We also offer a variety of Sponsorship Packages for even greater marketing impact. If you have a Halloween Attraction, presenting a Halloween Event, hosting a Halloween Party, or provide related professional services such as Entertainer, Decorator, Makeup Artist, etc. and you would like to be listed on this web site for FREE - Click Here Now!